CEO of the Danish Cyclists’ Federation, Klaus Bondam, reviews Copenhagen’s new city bike the “Gobike”. The “Gobike” has been awarded with the E-Bike Award 2014. 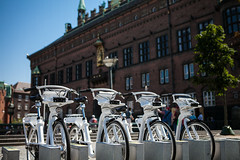 The Gobike” has also been exported to Norway, Spain, and the Netherlands. Watch the video with Klaus Bondam here. The video is produced by the Ministry of Foreign Affairs of Denmark.